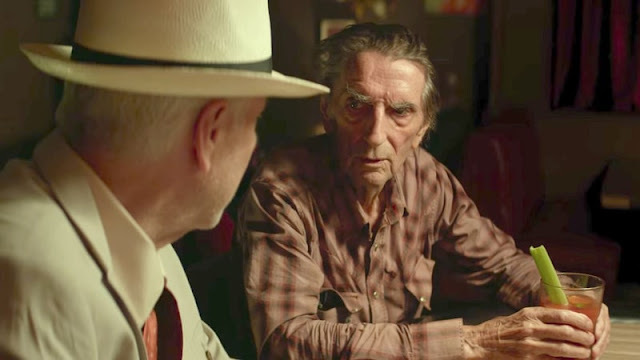 VIFF 2017—Screen legend Harry Dean Stanton's last starring role, Lucky, is a fitting and loving farewell to his storied body of work on the screen. Character actor John Carroll Lynch makes his directorial debut telling the story of a ninety-year-old small town man in the American Southwest going on a introspective journey of self-discovery in his everyday life. Stanton stars as the titular, chain-smoking curmudgeon realist who essentially believes in nothing. The low-key comedy features a stealthy cast of fine supporting actors including an inspired turn from filmmaker David Lynch as well as Ron Livingston, Ed Begley Jr., Tom Skerritt, and Beth Grant who egg on Lucky's gruff but affectionate ways. Co-written by actors Drago Sumonja and Logan Sparks (Stanton's assistant), they construct the story as a series of repetitive actions setting up Lucky's usual daily routine with a new wrenches that reveal his ever present sense of mortality without any hint of vanity. Lucky proves itself a quietly moving sendoff for Stanton. It's a properly eulogizes the actor's six decade-long career with a utterly contemplative performance. The plotless film is a slow but amusing rumination and tribute to a long lived life or loneliness and small moments only Stanton could really evoke. Lucky screened at the 2017 Vancouver International Film Festival as part of the Panorama stream.